Last year the Brat fry raised $4,006.38 for local disaster relief! Once again this year, the Fond du Lac Fire Department will be “taming the flames” of the barbecue grill to help the American Red Cross help our community. The Red Cross and the Fire Department are partners on several community initiatives from emergency education to disaster relief and recovery. Emergency responders have requested Red Cross assistance at 24 fires the past year alone! This is the largest number in recent years; a few years ago, it was only seven requests for help. With two recent larger apartment fires, the number of people being assisted is at an all-time high! “The Red Cross is a tremendous asset to our entire community so we want this event to be our biggest and best yet,” stated Fire Chief Peter O’Leary. To help the cause, you can pre-order brats and burgers by calling the Main Street Fire Station’s non-emergency number at 920-322-3800 by 9:00 a.m. on April 22. Delivery is available for orders over 20 items. You can also place an order in-person between 10:00 a.m. – 2:00p.m. at the Main Street Fire Station and enjoy our cuisine at the picnic tables. 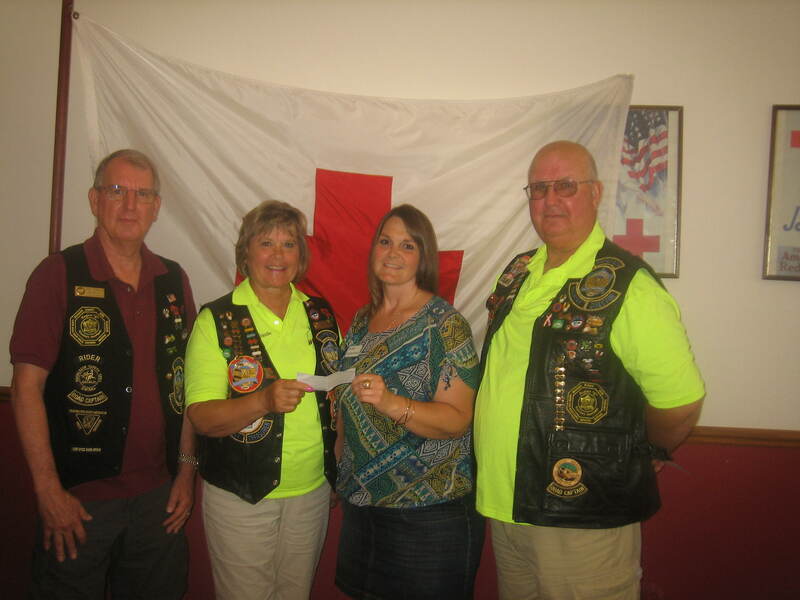 The Goldwing Road Riders Association made a check presentation to the American Red Cross for the brat fries they held May 3rd & 4th and June 28th & 29th in Fond du Lac. Every year they pick a different organization to donate the proceeds to from their brat fry sales. The association picked the Red Cross this year because we helped one of their members that was affected by a fire last fall, and they wanted to return the favor. They presented the American Red Cross with a check for $900.00 to continue our mission in helping others with disaster relief. It is an honor for Goldwing Road Riders Association – Chapter “C” to host this event. This year’s event will be for Chapter C and the American Red Cross. Please consider stopping by to visit and to see the Goldwing motorcycles on display. Also check out Chapter “C”s website at www.gwrra-wi-c.com to learn more about this event. A Simple Message of Thank You……. Thursday, May 2 we responded to a fire that displaced 30 people in Fond du Lac. On Friday, during the day we had about half of those people, adults and kids in our back room until we could work with the family on where we were putting them for the weekend. We gave the children coloring books to use, I rented some movies, but one of the things they like was drawing on the dry erase board. 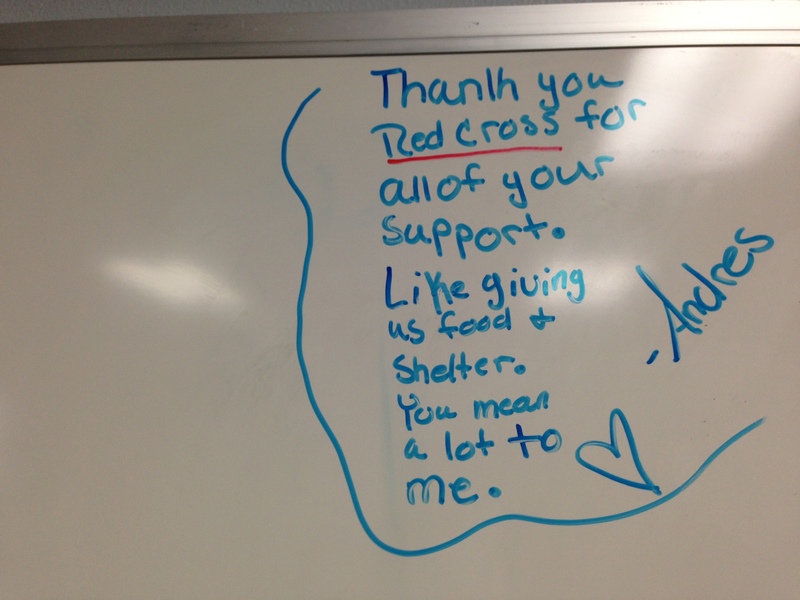 I found the message that one of the children left on the dry erase board rather touching. These are the moments I really appreciate working for such a great organization. Each year the Goldwing Road Riders Association, Wisconsin Chapter C, holds a Brat Fry with the proceeds shared with a charity of the clubs choice. 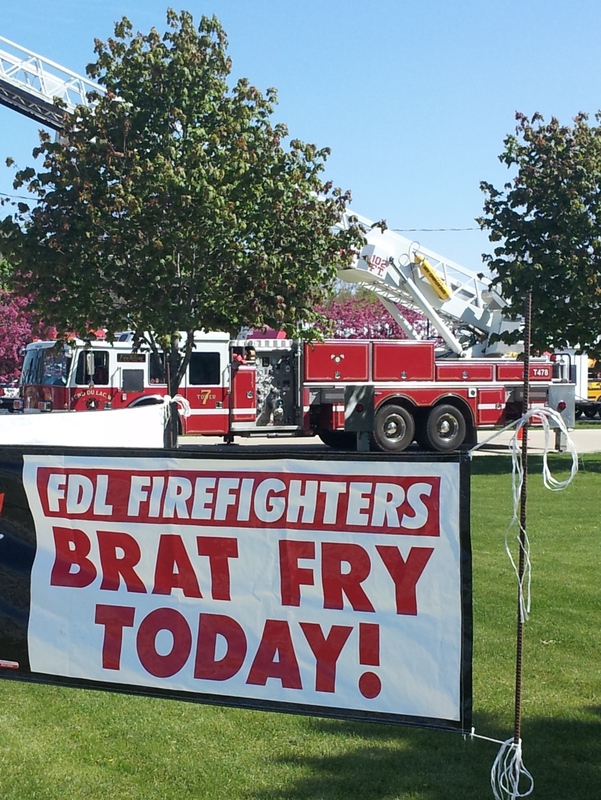 Over the past couple of years, the Ability Resource Center ( ARC ) of Fond Du Lac and the Veterans Museum and Education Center of Oshkosh have benefitted from the Brat Fry. One of the goals of our Chapter is to “give Back” to our community. This year, our Local Area Goldwing Riders had a tragic fire invade one of our members’ homes, rendering the house a total loss. One of the responding groups that was on the scene very quickly was the American Red Cross. So it was proposed by our membership to hold this year’s two Brat Fry’s for the American Red Cross of Northeast Wisconsin.